Contrary to popular belief, clicker training cats can train your cat and stop unwanted behaviors. 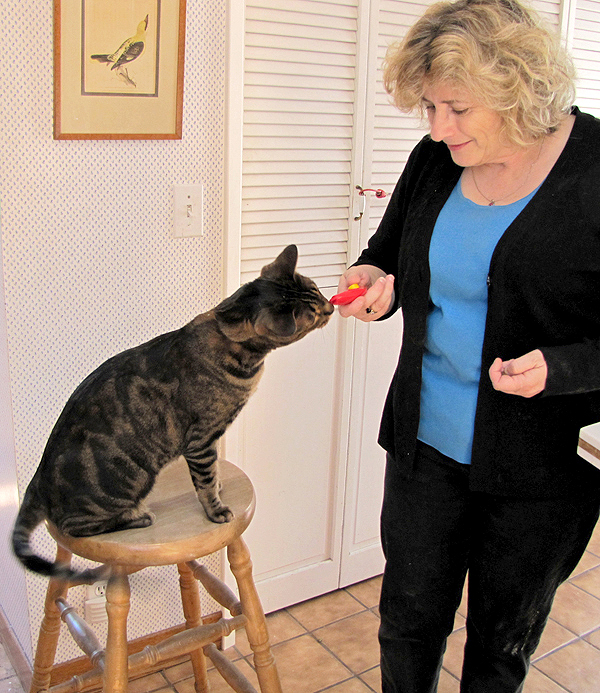 Here’s how to train your cat using clicker training. We live in an era where information about cats and cat behavior is readily available, yet many people still believe myths and fallacies about them. Two of the most common are that cats will do whatever they want, regardless of input from the people around them, and that they are untrainable. Sadly, these fallacious beliefs often have serious and sometimes fatal consequences for cats. Many people surrender their cats to shelters and/or have them euthanized for behavior problems that can be resolved. Others, instead of working to change the behaviors, will turn cats loose outside, believing the cats will be able to “fend” for themselves. 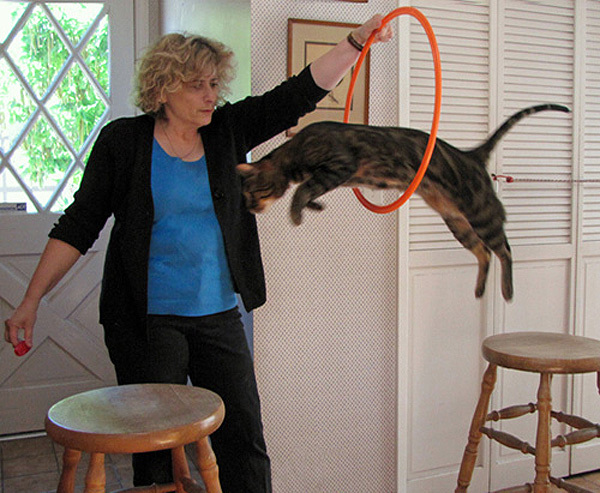 Clicker training can be used to teach cats tricks such as shaking hands, rolling over and jumping through hoops on cue, and it’s also very effective for stopping unwanted behaviors and building new ones. Clicker training cats also helps them feel secure, it reduces stress, it strengthens the bonds between cats and their people and it is mentally stimulating. It is a great way to focus the cat away from the problem behavior while giving the cat something more acceptable and fun to do. It is one of the tools in my virtual took kit, useful for helping my cat behavior consultation clients change annoying cat behaviors. The first step to clicker train cats is assembling two fundamental tools. The first is a treat the cat adores. In Clicker-Speak, the treat is called a “primary reinforcer.” Treats are so incredibly motivating that the cat will do just about anything for them. Although the easiest treat to use is food, not all cats are foodies. For cats who are picky eaters or aren’t motivated by food, there are other activities that can double as primary reinforcers. A couple of strokes can be a treat for cats who love attention — those who enjoy being groomed thrill to the feel of a brief brushing. Once you find a motivator, you need a device that always performs the same action when activated. It might make a sound, or emit a flash of light or a vibration. In clicker terminology, after being paired with the treat, it is called a “secondary reinforcer” or “event marker.” The action from this device marks good behaviors the instant they occur. The most popular event marker is the clicker. And, of course, you need a cat. After assembling the tools, the first task is pairing the treat with the click so that the cat has a positive association with the sound. It is easy! Immediately after clicking, give your cat a small treat. Wait until he has eaten and looks back up at you before clicking and treating again. Depending on the cat, it takes between five and 20 repetitions until he makes the connection between the click and the treat. 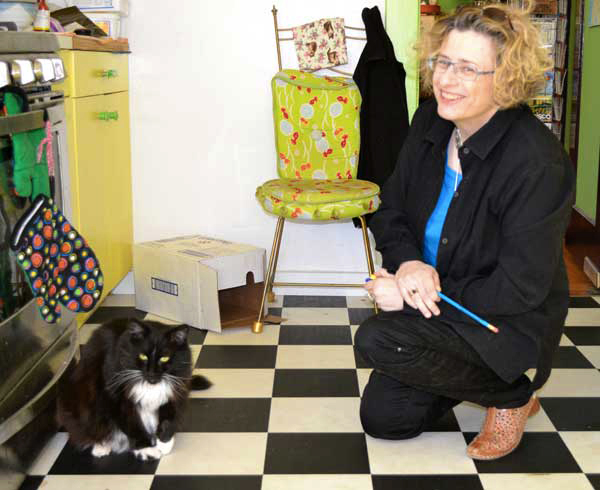 Pairing the treats with the sound results in the click becoming a powerful communication tool — alerting the feline the instant he is doing a desired behavior. Once the cat has a positive association with the click, you can start using it to change behaviors. A simple click, followed by a treat, will communicate to the cat when he is engaged in an appropriate behavior such as scratching a scratching post instead of the furniture, or hanging out on a shelf instead of lounging on the keyboard. Clicker training grows from the simple click. 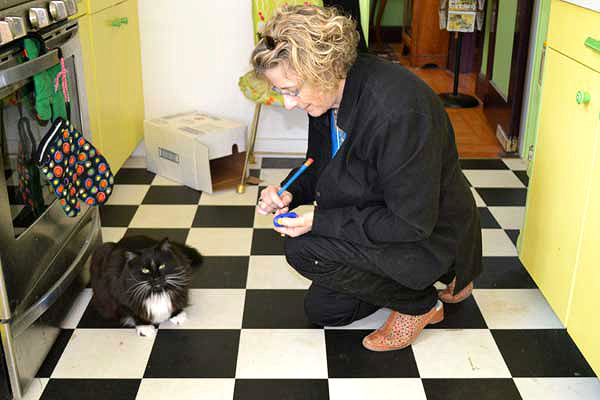 The next exercise is target training — the cat touches a target with his nose when cued. A target can be a chopstick or the eraser end of a pencil. 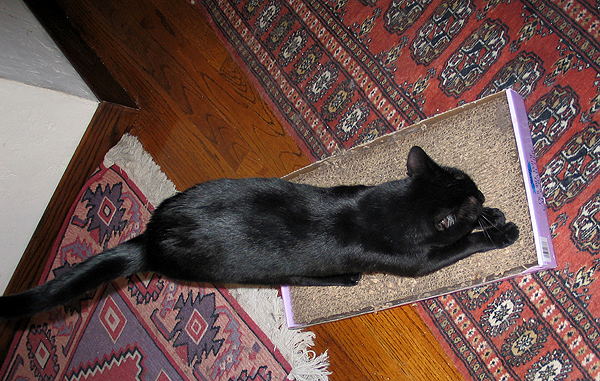 Start by lowering the target to the same level as the cat’s nose, but about 2 inches away from him. He will automatically reach and touch it with his nose. Just as he touches the target, click once and then immediately toss him a treat. Move the target away from his line of vision and wait for him to eat his treat and look back up at you. Repeat. Repetitions are good — they help build behaviors. It is important to click only when the cat does the behavior you want, which in this exercise is touching the target with his nose. Cats sometimes become creative, touching the target with different parts of their body. If your cat does creative targeting, do not click. Instead, remove the target from his view, wait until he looks up at you again, and then lower the target for him to touch with his nose. Timing is essential. Whatever action you click is reinforced. Click at the same time the cat touches the target. Do not click before or after the touch. This is a perfect first exercise. Although basic, touching the target teaches the trainer and trainee the fundamentals of clicker training while building a mutual language. Touching a target is the building block for learning how to clicker train to modify unwanted behaviors and teach complex tricks. To learn how to use clicker training to help change behaviors and teach cats tricks, check out my book, Naughty No More! I am wanting a “clicker” that will teach a cat to stay off the kitchen table and kitchen counters. Will this work? I would like a hand held device. I am hoping you can help me (to help Max!). I rescued him recently. He was abandoned some time ago – malnourished, dehydrated, severe fur matting, one testicle, and a very annoying and loud meow. His one testicle has been removed and tomorrow the vet will check inside for the possible missing one. He’s currently in my bathroom as I have 3 other kitties in my apartment and nowhere else to keep him. He’s spraying everywhere hence I couldn’t keep him in my bedroom. So the behaviors he has are – very loud and constant meow and yowling and spraying. I do hope with time these will calm down. I was thinking to try clicker training. But I think right now he just needs some time to calm and then maybe I can introduce him to my other three and work on his behaviors. Thinking a diaper for the spraying. I have read and read and read. Healthwise he’s been checked and is fine.